Ready to be inspired? These 15 colorful baby nursery ideas are so cute and filled with so much DIY inspiration for your baby’s room! Waiting for the arrival of a baby is one of the most magical experiences! There is so much hope and wonder as that little one is growing inside – who will she be? What will he look like? What will her personality be? There is so much nesting going on, too! As mommas, we want everything to be picture perfect for the arrival of these little bundles, especially their new homes in the nurseries! There are so many different directions you could go in when it comes to the nursery. Some of my favorites are colorful nurseries and I knew that’s the route I wanted to go for Little Miss’s nursery. You can see my inspiration board here! They are so bright and creative and the perfect “Welcome Home” for these sweet babies! 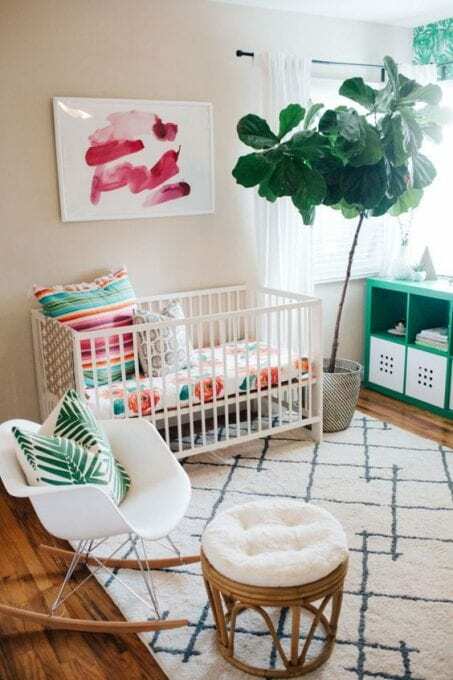 Here are 15 colorful nurseries that I just can’t get enough of that were inspiration as I put together Little Miss’s nursery! The bursts of orange and yellow add such a cheerfulness to this decor. 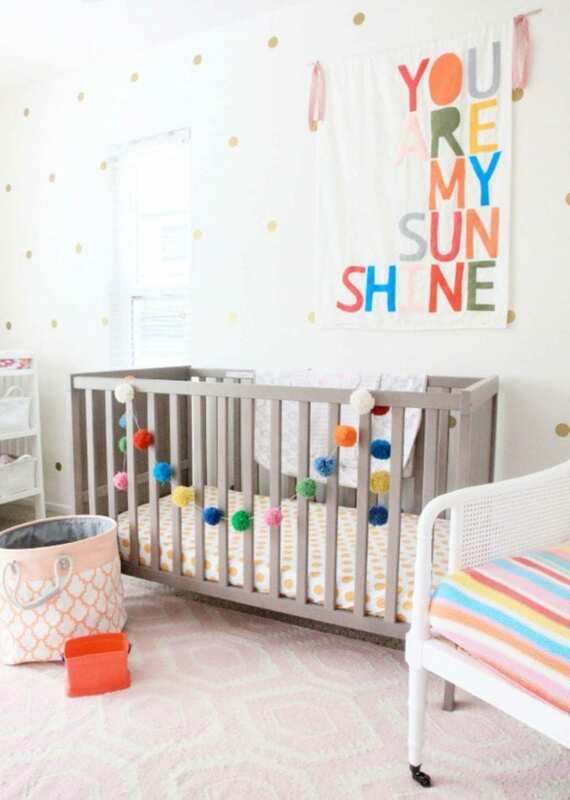 You can’t help but smile walking into this room, and your baby will love all the bright things to look at! I love the natural feel that the greens add to this room. It really brings the cool and crisp feeling of nature to the bedside of this little one! The green-blue combination gives this room a surge of brightness and life against the clean backdrop of the white walls! And I love the burst of light that the ceiling fixture brings! Of course, I had to include Little Miss’s nursery in this roundup. 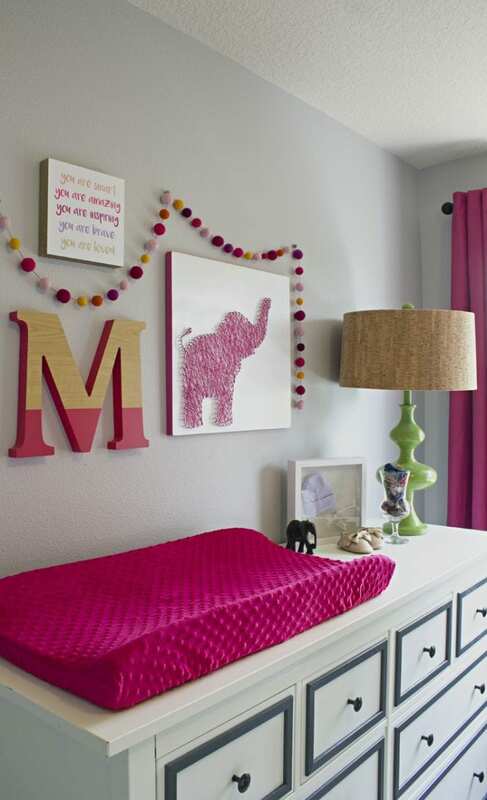 This DIY felt ball garland and elephant string art decor were the perfect additions to add some pops of color in her room. The contrast of the pale walls and colorful curtains and blanket really adds a liveliness and energy to the room’s atmosphere! And that is such a cozy chair for nursing or rocking a baby to sleep! Being a Dr. Seuss fan, I love the theme of this room! The orange picture and rug pair perfectly with the soothing blue and bright lime. Not only do the colors mix so nicely, but the different patterns of the fabrics are ideal compliments! 8 | Rosie’s New Nursery from The White Buffalo Design Co. 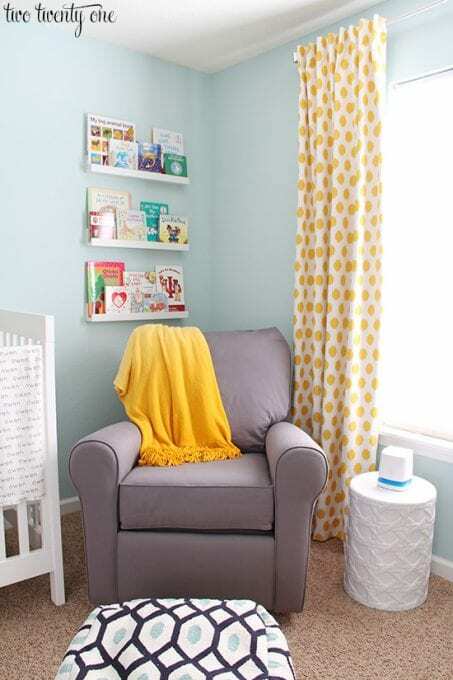 This chic space is one that not only will baby feel right at home, but mama will as well! Who wouldn’t want to pass all hours of the day (and night) in this gorgeous room? 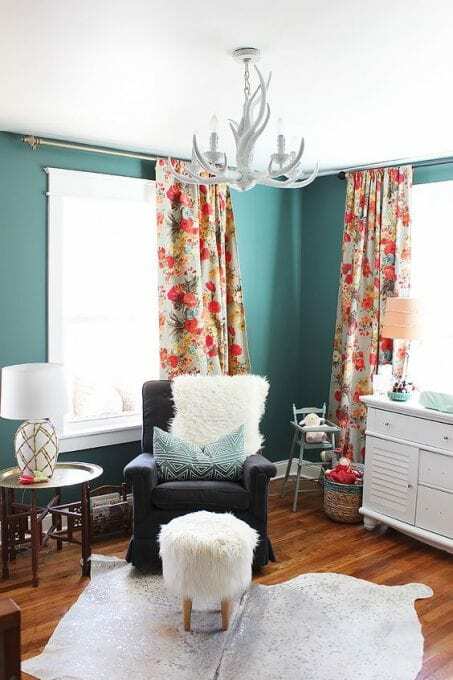 The bursts of color in this neutral room combine perfectly! These beautiful hues spread throughout the space without being overwhelming. Flawlessly executed! I literally want to hire this lady to come decorate our home. GORGEOUS! 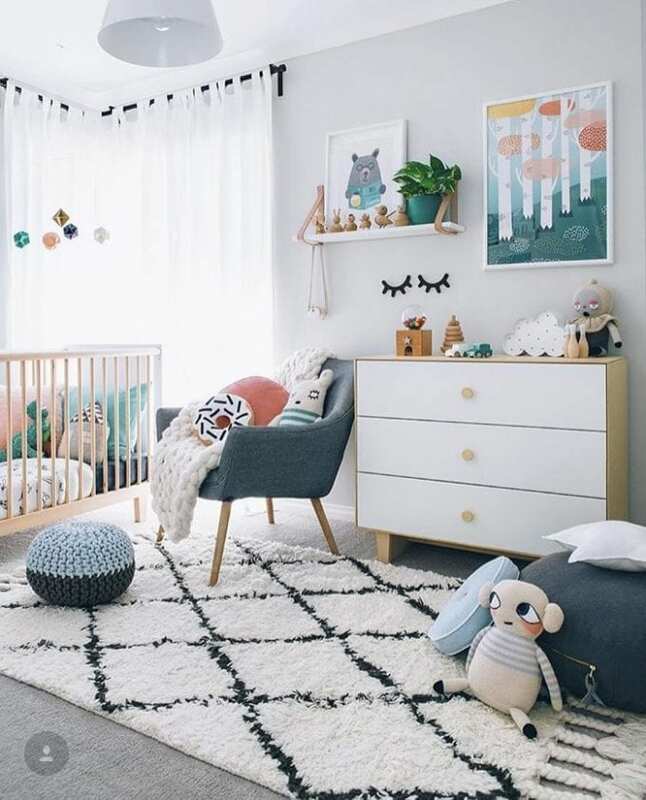 The patterned curtains, the striped dust ruffle, and the colored light fixture all add the ideal amount of color to this room to create a calm yet engaging space for the little one! Primary colors mixed with the trendy chevron grey and gold is the perfect compliment to one another. 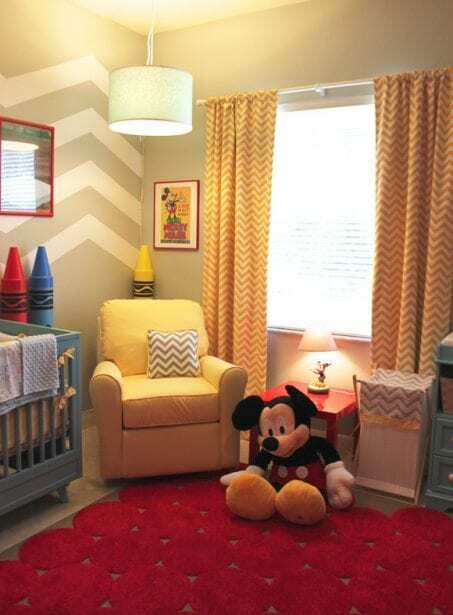 And what is more cheerful in a baby’s room than Mickey Mouse? This is a beautiful, bright and bold take on a jungle theme! The green/blue/white are perfectly balanced and bring the fun and energy and silliness of monkey business from the outdoors right to the crib! 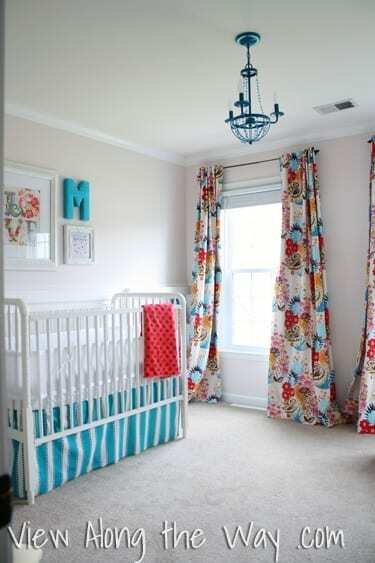 This nursery is just gorgeous! 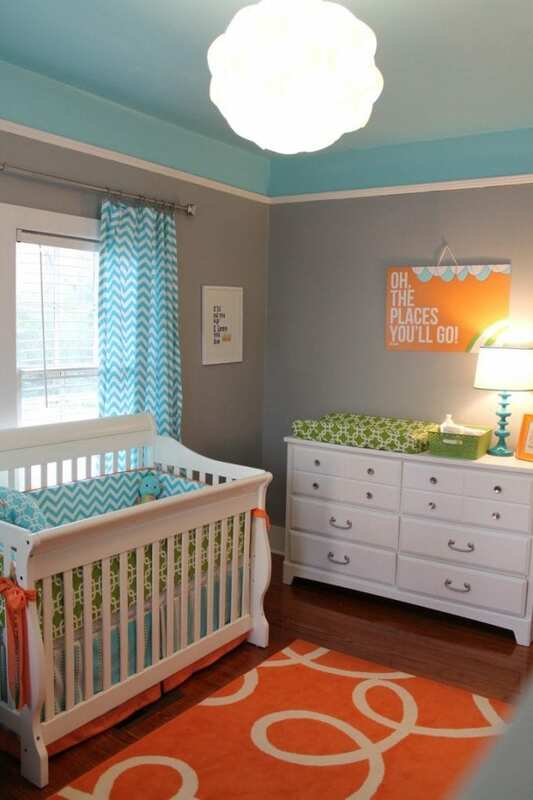 The explosions of color are impeccably placed throughout this nursery. It’s such a creative take on a safari theme. If you like this one, you need to check out the other pictures. They are amazing! 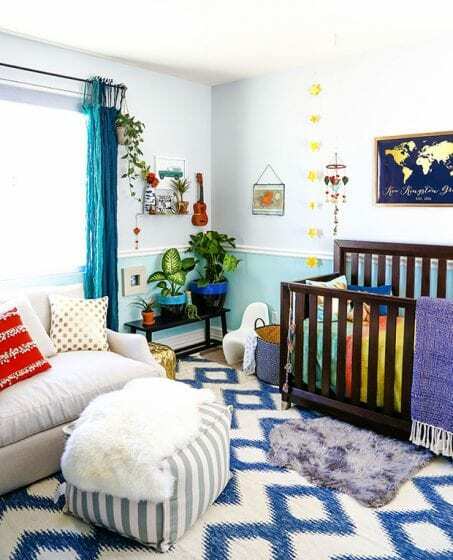 This is another nursery that has white walls but bursts of color in just the right places! 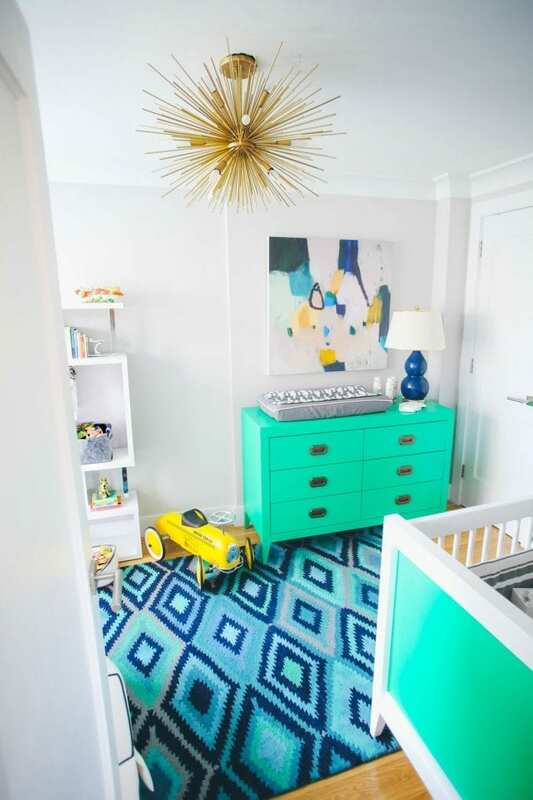 The rug, the pillows, and the light fixture all add the right amount of color to make this a clean, inviting home for a baby! This is such a happy room! I love the wall hanging above the crib, and all of the other fabrics bounce beautifully off of that. And that pom pom garland! So sweet! These creative and colorful nurseries just overflow with love and anticipation for the sweet little one who will soon make an entrance! Another special way to celebrate a new baby’s arrival is the gender reveal! Check out these gender reveal ideas for some fun inspiration! Lovely ideas! My favourite is CHET’S NURSERY FROM OH.EIGHT.OH.NINE – it looks really great and cosy place. The one with the monkeys is also very nice. A friend of mine has done something similar as diy project for her son.